I almost subtitled this article “The Usual Suspects”. We were one of the very few publications to pick Kawasaki’s Ricky Carmichael to win last year’s 250 Outdoor National Motocross championship. Unless you left planet earth a year ago and just got back, it is no surprise that we are picking RC again this year. This guy has won everything in sight during that year, and now has five National championships at age 21. Enough said. Also like last year, Honda’s Sebastien Tortelli has to be considered in the runner-up spot. Tortelli has great speed outdoors, and is even capable of beating Carmichael in any given moto. He has not shown Carmichael’s consistency, however, and has frequently come up with injuries (major or minor) that interfere with his points total at the end of the championship series. If Tortelli stays healthy all year, he could battle Carmichael down to the wire. In the third spot, we are picking a guy who thrives on hot days, rough tracks and long motos. Honda’s Mike LaRocco eats this stuff up. Although he hasn’t shown the speed of Carmichael and Tortelli, he is plenty fast and consistent. He also loves his Honda, and will be a threat to win the occasional moto. Other riders you can expect to see on the podium frequently include Yamaha’s David Vuillemin (reportedly, fully recovered from his broken collarbone), Honda’s Ezra Lusk and Ryan Hughes, and Suzuki’s Kevin Windham. Vuillemin looked like a threat for the title last year early in the season, but ultimately lacked Carmichael’s speed (as did everyone else). Vuillemin is a year older and wiser, and he could win motos this year. We are predicting he will finish fourth. Honda’s Ryan Hughes is very fast outdoors — faster than most people here in the States remember or expect. He won a moto at the Motocross Des Nations last year, and he likes the new Honda CRF450. We will pick him for fifth, but he could easily finish higher. Suzuki’s Kevin Windham is always the big question mark. Windham has the speed to win motos and even threaten for the championship, but his consistency has been lacking since he left the 125 class. Expect Windham to frequently run near the front, but finish sixth on the year. Honda’s Ezra Lusk is an awesome Supercross rider. He is currently more of a threat to Carmichael on a Supercross track than Yamaha’s Jeremy McGrath. Lusk is not a consistently fast Outdoor rider, however. There is something about his style that seems to favor Supercross over Outdoor tracks. Nevertheless, Lusk is healthy and hungry, and he has a huge heart. He could finish higher, but we are predicting he will finish the series in seventh place. Other riders to watch include Yamaha’s Tim Ferry, Kawasaki’s Stephane Roncada, and Suzuki’s Jean-Michel Bayle (who is expected to ride the entire series). Expect Ferry to be the fastest of this group, and the most consistent. Roncada can certainly put together a good moto, now and then, but this is his first year in the 250 class and we don’t think he has the speed to run with the top three or four guys consistently. 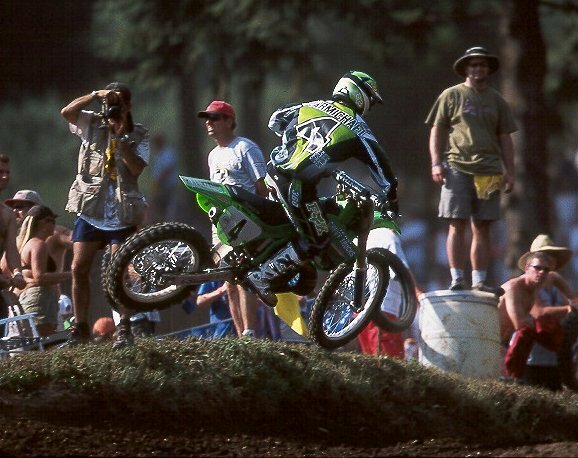 Bayle is a legend, and one of the greatest riders of all time (street or dirt). It is hard to imagine that he can come back and race motocross at this level after so many years, however. Now in his mid-thirties, his ability to race two long motos every Sunday has to be questioned. His natural ability, however, is unquestioned, and this could allow him to occasionally startle other riders in the class. We just don’t know what to expect from Bayle.